"the most likely scenario is awaiting orders. The tanker market is very poor at the moment and has been for several months. It's certainly not unusual in such circumstances for ships to hang around in the same area doing nothing for weeks, sometimes months on end. The area around the Canary islands is geographically important in this respect as it's on the junction of major seaways and means that vessels can go East or West easily should orders come in"
No more earthquakes and a collapse of harmonic tremor at approx. 18:00. The subsiding process started at 13:00 UTC when we saw a period of limited less energized bursts (could be seen on the webcam). It picked up a little bit in the late afternoon to subside almost to 0 around 20:15. At 20:40 we had a new (limited burst) lasting 8 minutes and since then the signal has been stabilized. Another indication of subsiding activity is the lack of bursts during the last several hours. In a short interview Joke Volta had with Carmen Lopez from IGN earlier today, Mrs. Lopez reiterated that the decision of delegating the nightly surveillance to Madrid had been taken because seismicity (earthquakes) had almost completely stopped and because harmonic tremor was more or less stabilized. The current data analysis showed a stabilization or even subsiding eruption. As far as the signals are this evening the volcano seems to obey and the eruption has drastically subsided. It might have been a collapse of the vent, as it occurred a number of other times, but during the past processes the earthquakes picked up soon after the collapse. As there is still a remaining signal at the moment the eruption is continuing at a far lower almost survival level (Christmas and New Year holidays vacation ?). - People living at the Canary Islands looking regularly on the islands seismographs might see the signals of the M 6.3 earthquake at the Kermadec Island (Pacific Ocean) showing up on the seismogram (after 10:10 UTC). Update 15/12 - 15:00 UTC - Why a ship ? - As you all know IGN almost immediately said that is was a boat. The reason why will be explained a little later in an interview we will publish from Joke Volta with Carmen Lopez, chief scientist of IGN at El Hierro. - People of El Pinar went to the viewpoint and said also "it is 'probably' a boat". - Joke talked to a number of people and they said that they had seen a boat at sunset at the Lighthouse horizon of the Las Calmas sea. - Next, Joke looked with her binoculars from El Pinar high above the sea and could see some lights at the horizon. As Joke knows the location of the vent very well, she was more or less convinced that it could not have been the vent but what else than a boat. The location of the webcams is totally different as they are installed on a hill near La Restinga. We @ ER started looking into to real time navigation maps, but we could not detect a ship to the south of El Hierro. - This morning she saw this boat again and she started looking in the internet for the name and position. She made a picture this morning and indicated the different positions she saw it (see image below). - Paul, a ER reader traced the boat this morning on Marinetraffic.com and on http://www.localizatodo.com . The ship was recognized as the C-Whale (see picture below). Paul also said that the only reason we have not seen this ship on the map during the evening and nightly hours must have been that it had switched off his transponders. Why ? Why was it hanging around in that area ? What was he burning ? It does not look like they had a barbecue on board - . Nobody knows. All other questions (easy to come up with more than 5 immediately) will never be solved. Once again thanks to all for cooperating on this issue. This story has now been finalized (at least for earthquake-report.com). Hmmm. I have carefully watched the videos of the strange lights recorded by the web cams on the evening of 14 December, and I am more than ever convinced that they are absolutely NOT related to volcanic activity, take a volcanologist’s word for it. The way the lights are moving from about 02:30 min in the second (shorter) of the night videos is clearly indicative of a ship. There’s no way in the physical word that incandescent rock will remain persistently incandescent when it’s in the middle of water, any piece of incandescent rock would be chilled and lose its incandescence at least on the surface. Thanks all of our readers for having seen these lights/fire, reporting them at an early stage and joining the investigation/ debate. IGN has hundreds of observers all over the world to look over her shoulders to this ongoing eruption. PEVOLCA will stop its 24 hours surveillance in La Restinga but the Center for Permanent Care (CAP) will stay open at La Restinga from 08:00 until 20:00 daily. In between 20:00 and 08:00, people will have the possibility to call a guard able to give answers to most questions or urgencies. Pevolca (based on the data delivered from IGN) says that there is NO indication the the process is deteriorating or is becoming more dangerous. IGN reported the eruption process to be stabilized. Pevolca also said that if whatever new indication of a reactivation will be noticed, they will return to 24 hour surveillance instantly. The decision has no influence on the alert levels currently in place at the Island (yellow alert at the entire island and red alert in a radius around the Las Calmas sea vent). As promised before, another slower time lapse video of Julio. The same remarks as below. It is strong for believers and non-believers. Only an interview with the webcam operator might give a clue on what he saw. Some comment : the time lapse speeds too much to sea what we have seen on the live webcam, in other words - smoke, flares, etc. Julio will make another much slower time lapse from 19:30 until 20:30. The mystery will certainly remain, but we will share with you all what we possibly can notice, record, describe etc. Reports from tonight are mentioning a ship at the horizon navigating towards the west, but the floating we see on the screen moves to the east and at a quite strong speed, not like a slowly moving ship at the horizon, unless it was very close to the vent (but the 4 km radius is still maintained). 19:45:14 - 3 red points are showing up at the horizon, the middle one being the strongest These red points are showing up a little higher than the active vent, but horizontally right on the vent location ! 18:48:26 - 58' - The operator seems to move the camera and is zooming out completely, probably because he must have seen the lights in the background ! At this moment it it still a big mystery. 2 main scenarios are currently floating around, but none of the 2 can be proved ! A lot of questions remain. They may have get the answers, but we do not know them. b) the hundreds of people from the Canary Islands and from around the world who were all convinced seeing "burning material". When we at earthquake-report.com started to look at the webcam we saw no lights on the village webcam, but we saw many chunks of burning material at the right side of the screen. The material was behaving like we would have expect to see it if it burned. Why ? In order to get fire, the triangle of fire has to be present = oxygen (material coming from the sea floor vent gets oxygen when it arrives at the surface) + a burning material (the chunks coming to float on the sea may have had enough remaining material to burn) + high enough temperature to ignite = fire. During the burning process the many blocks were certainly not controlled as the combustion process was very irregular, sometimes with powerful flares and the smoke could well be seen. 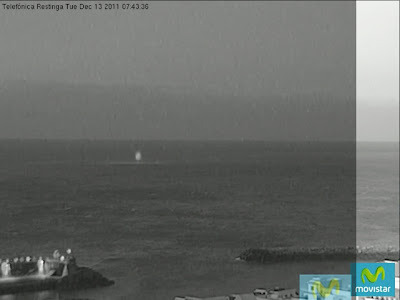 The Telefonica Cabildo webcam has been zoomed out so that the harbour lights can be seen. The earlier image was a very unstable zoomed image. No more news from the officials, we are sure that they are still discussing about what happened and nothing can be excluded at the moment. There are different theories possible. The so called ship navigating to the left can also be a sea current carrying the floating material into a certain direction (to the left / east in this case). If you feel betrayed on what happened tonight, there are also local people who are still discussing about it. Believers and non-believers @ Avcan for example. Those people who have seen the burning material in the beginning (like us) saw many blocks sometimes almost exploding (flares). Diana, a reader has videotaped this early fragment and the doubt is there again ! This does not look like a ship, but we do not know what it is. We cannot embed it, but here is the link to the video (taped from the webcam). Update 14/12 - 20:53 UTC - burning material is a hoax, in other words a ship. Joke just cell phoned me that the people going to check it say that it is an ship (un barco). Also we are thinking now that it is a ship (what is this ship doing there ???). Reason : the lights are just moving to the left at a steady pace. So, we are 95% sure that Joke just told us the truth. Our many readers were sending comments and so many other people also saw the lights on the webcam. The image was convincing as one could see many patches of flames in the ocean. What we found strange at the beginning is that the village webcam had NO fires only with a lot of very faint points of light. IGN (Carmen Lopez) was very right from the very beginning. Joke told us a little earlier that some people had seen a ship at the lighthouse earlier tonight (these things are being told now). Our advise to those people feeling betrayed by what happened , take it positive : Pevolca may be sure from now on that a lot of people (everyone following what happens around the volcano) are taking care of El Hierro by looking frequently at the webcam. Joke just told us that IGN expect it to be a ship. Jesus, from El Pinar safety and a few other people are heading for the Naos mountain to check whether it is really burning material. We appreciate them doing that. We do not think that the current phenomena is dangerous, even when it is burning material (there is skilled personnel enough at El Pinar and at La Restinga to make this kind of prognoses). Especially for those people who missed it today, a small time lapse we made ourselves showing the action around 17:00. Probably a better one from Julio will be published later on (in that case we will delete this one). Reader Peter van der Woude commented on this article and we are happy to include his slightly colored today's NASA MODIS picture in the main article. - Apart from the nightly observations, the jacuzzi this morning and the wide stain still to be viewed, nothing extraordinary has happened since a couple of hours. - The depth of the 04:02 earthquake in the El Golfo area, who originally was quoted at 2 km has been updated by IGN to 21 km, a normal depth for these earthquakes. There is some disbelief for the nightly glowing lights ! Some people are saying that it might have been an airplane or a boat. We, at the other hand are "believers", which means that we do not believe in every other source then emitted material unless Sasemar, Involcan, Avcan or any other group does say that they have been with a boat on the vent. Except from taking pictures at the Naos mountain (she was a little disappointed after being alarmed by us that smoking lava may be seen), Joke also went to La Restinga ( she had to walk the distance -luckily downhill) and could find out that the Sasemar, an airplane seemingly used to observe the volcano at night probably did not fly because it was under maintenance. The RTVC webcam is working again. It shows an astonishing wide gray stain, which will be probably better seen on the satellite picture within a couple of hours. The active area can be divided into 2 parts : a) in the front strong stirring and b) a little higher in the webcam the champagne bubbles like we saw yesterday. Have we said something wrong ? Only the Ustream webcam seems to work this morning. Update 14/12 - 09:39 - Why ? - why are the Guardia Civil helicopters not flying anymore ? - why are sea water temperatures not published ? - why have the oceanographic vessels disappeared ? - why do we have no more water sampling by coast guard boats ? A few remarks on the paragraph “Why?” posted on 14 December 2011, 09:39 h.
Why are there no helicopter flights and research ships any more in the eruption area? The answer is very simple: because they cost A LOT OF MONEY. And since the eruption does not appear to be very dangerous as it is, no one is interested in spending money just for the curiosity of a few scientists and volcano aficionados. Especially now that we’re in the midst of a massive economic crisis, with Spain being among the countries most severely affected … I can tell you first-hand, being an employee at the institution responsible for the monitoring of the Italian volcanoes – the INGV – that we haven’t seen much helicopter support during the past few years due to budget cuts, even this year with a lot of activity at Etna and Stromboli going on. Unless there’s proof that it’s very dangerous, you’ll not see a lot of funding these days for such costy enterprises such as helicopter flights and scientific ship cruises. Why are the webcams not functioning well or not at all? Because those who are responsible for maintenance are either not getting paid to do extra work (I suppose they have plenty of other work to do in their everyday lives) or they are not interested, or a combination of both. Why do much effort just to see a few bubbles, a bit of dirty water and maybe every now and then a wisp of vapor, what’s all the hype about that? Why is a lot of data not being made public? Well that’s how things work in a scientist’s life: there’s some institution funding you, in the case of the Italian INGV it’s mostly the Italian Civil Defense, and THEY want the data first-hand. So that’s basically what you produce them for (besides your personal academic curiosity, if you have enough idealism left). Then, scientists like at the IGN and at the INGV, have to think twice about what to do about their data. For many of us, making a step forward in our careers depends heavily on scientific publications – “publish or perish” is the motto, and that does not mean publication on a free web site for the satisfaction of some volcano enthusiasts, but publication in peer-reviewed scientific journals. So if you are a scientist like me or many of the colleagues working on the El Hierro eruption, you’ll probably save your best data and information for scientific publications, which unfortunately take a long time to go through review and editorial processes, and nearly always require uncomfortably high fees for the download of an article of a journal’s web site. - The Ustream webcam shows an active wave area who is far bigger than the preceding days. The eruption webcam shows (smoking material or vapor) this morning ! - At 04:02 UTC an earthquake occurred at a depth of only 2 km ! in the El Golfo bay. Click here to see the map with the epicenter. This may be a totally new development if this happens again. The distance to the coast is approx. 5 km (thats the good news). The earthquake has NOT altered the hydromagmatic explosions in the Las Calmas sea. Julio was not resting before he was certain that the light he recorded wasn't traced back to the exact location. He superposed two images and scaled them so it would coincide with the port location and position. The effect is amazing. The flashlight really came from the vent and because of the distance it must have been a couple of meters high. Of course it can still be a boat, but we do not believe in that scenario as Julio looked at the other recordings later and NO boat was seen in the area (at least no boat lights). Julio will check his recordings during the morning hours to find out if new similar events might have occurred. The light must have been meters high based on the distance from the webcam (the webcam was not zoomed at the time). Hot glowing material seen just before midnight ?? The video is showing after 11 seconds some object lighting up in the sea and a couple of seconds later another one lighting up. Is it a boat ?? We don't think so, especially the second object shows a light which is extinguishing smoothly. - At 15:59 the Canary Islands Security committee (Pevolca) has published a press report on the situation on December 12. Nothing new there. Compressed they are telling that the eruption process continues as can be seen on the harmonic tremor. The tremor amplitude got a little stronger but became more irregular + the rest has been described in this article. Pevolca is publishing what everybody can see but is giving seldom an explanation for what is happening like the champagne jacuzzi today. Pevolca never comments on what is happening the same day unless they have an urgent meeting. A new 4'48" Julio del Castillo Vivero time lapse video. The original images have been altered to bring up detail of the steam coming out of the water (ER : water vapor not a volcanic cloud) . Time Lapse comprehending the period between 16.35 - 17.32 GMT/UTC With water bubbling and 'jacuzzi' style at El Mar de las Calmas, near La Restinga, El Hierro. People still looking at the eruption webcam can see clearly the drifting water vapor . To prove our case, we have been increasing the contrast of the Telefonica Cabildo Eruption webcam image and below is the result. Above the active jacuzzi you can see the foggy water vapor, below the Las Calmas sea without the steam. Those looking at the webcam have the daily difficulty of the backlight of the sun. Nevertheless the eruption jacuzzi, champagne area can still be seen very well on the Cabildo Eruption webcam. A REMARKABLE 3 minute Julio del Castillo Vivero Time Lapse video comprehending the period between 12.42 - 13.42 GMT/UTC With water bubbling and 'jacuzzi' style at El Mar de las Calmas, near La Restinga, El Hierro. Julio combined 3 different elements with each other a) the image of the RTVC webcam (which has no clock !) b) a clock he connected himself to the video and c) the harmonic tremor graph from IGN. The combination of the tremor graph and the webcam image has not been published anywhere else as far as we know. Congratulations to Julio. We think, but we are nor sure for 100%, that the current activity above the vent looks like degassing bubbles, which means if this process continues from now on that the bubbles of the vent gas expansion reach the surface. To make our case, we have been surfing on the internet and came out at the activity of the Eifuku volcano located at the Mariana Islands arc. The activity of the volcano was videotaped by the Ropos rov (Remotely Operated submarine Vehicle). The vent of the volcano was in this case 1350 meter below sea level. A similar kind of activity may be the case here. The images below are courtesy vulkaner.no. People who want to find out more about these pictures can click on the vulkaner.no link. As we told you yesterday, Joke felt that she had to take the bus from El Pinar to La Restinga enabling her to take pictures from the Las Calmas sea and surroundings. The series below are very beautiful. Unfortunately there was other weather today than yesterday (a cloud deck) and our experiment to show the vent making clouds has not succeeded today. One picture in the series shows however a low cloud forming above the vent. It might have been also in this case purely coincidence :). If you want to see the pictures in full format, please click in the main picture screen. It is very unfortunate that the Guardia Civil helicopter is not flying above the vent anymore. It would enabled us to compare the present jacuzzi with the earlier ones. Reader Penny did send us a Cabildo Telefonica webcam capture of bulging water this morning. - the tremor signal seems to have subsided a little unless IGN did some rescaling of the graph. Bursts are less frequent than this morning and yesterday. We remind our readers that what we witness right now at El Hierro is unprecedented volcano reporting in modern times. A Submarine volcano gradually growing from the sea floor to the surface. Thanks to the data of IGN, IEO and CSIC, the great images and videos from INVOLCAN, ITER and the GUARDIA CIVIL HELICOPTERES , the lively discussions and guiding in Spanish from AVCAN and in English from Jonfr and Volcanocafe , the webcams of the El Hierro Cabildo and Telefonica, RTVC and the Canary Island government and the El Pinar authority, the time lapse videos from Julio del Castillo Vivero, some internet sites (ER is only one of them) and last but not least the support of our volunteers, Joke Volta and Ian Carson, a submarine volcano has never been documented so much. We thank all of them on behalf of the thousands of daily readers following this volcano birth in the earthquake-report.com website. - The RTVC webcam is showing a very turbulent Jacuzzi activity. The hydromagmatic bursts are having a growing impact on the surface waters and more than once the water is bulging. - Joke is still taking pictures at montaña Naos of this mornings cloud, jacuzzi and stain. The weather conditions are however totally different than yesterday, so we think that yesterdays vapor clouds may not be present today. INVOLCAN new CO² data shows a considerable further decrease. On December 5 the amount of carbon dioxide amounted to 1560 ton daily, yesterday 978 tons. - Medium harmonic tremor with bursts every 5 to 10 minutes (hydromagmatic activity - see link to paper below). This happened all the day long - see graph. First of all we like to stress that we NEVER said that the discussed clouds have a Volcanic origin. They are definitely not. Almost all of our readers are commenting that the wind was blowing from the North East, which we also confirm. What we were telling in this series of updates was very controversial as we claim that the contrary is happening with the vent clouds. We also have a hard time to believe it, but we can only report what we see. Tonight when it was getting darker we were focusing on the Telefonica Village webcam and followed the cloud forming very carefully. Exactly the same phenomena was occurring. The main clouds (big white patches) where blowing to the South West, but a lower faint cloud deck was forming with origin in the vent and moving to the north East. PS : we are not making this up to attract attention. We do not need to become another site than we always have been ! It would be a lot easier when INVOLCAN made the temperature scan of the vent waters. Until now ALMOST NOBODY believes that this cloud might be originating from the vent, a lot of non-believer theories are circulating but so far nobody could explain the combination of the clouds on Joke's pictures / the MODIS satellite image and the strong activity of the water this morning. The coincidence layer is getting thinner and thinner. A temperature scan of the surface waters of the vent by the Guardia Civil helicopter / Involcan would certainly solve this discussion. The image below has been taken this morning in between 08:00 and 09:00 this morning by Joke Volta when she drove with the bus from El Pinar to La Restinga. In search for proof of the NASA MODIS satellite picture, we found this image to exactly proof what is going on. The grey spot on the picture is the main vent and the cloud forming is starting just above the vent blowing to the left. The amazing NASA Satellite MODIS picture taken at 11:55 UTC this morning (3 hours ago) is showing a cloud blowing towards El Hierro (starting at the location of the main vent). Even we do not believe it ! Is must be a coincidence and if not than we have detected the steaming vent waters. The image cannot have been 'photoshopped' as it has been extracted directly from the NASA website . The distance of the source of the cloud (narrow beginning) is approx. the same as the distance from La Restinga to the vent. Coincidence ??? If the MODIS image is what we think it is, that will mean that the water surface temperature has risen a lot to be able to create this amount of vapor. At least the vapor cannot be noticed on the webcam images. An infra-red webcam would have solved this problem immediately. (Thanks to Julio del Castillo Vivero for sending us the NASA link). - As we are currently in a submarine eruption phase with hydromagmatic bursts, we have searched and found a scientific study about such action. In 1984 Kenneth H. Wohletz and Robert McQueen from the USA Los Alamas National Laboratory wrote a paper with the title : "Experimental Studies of Hydromagmatic Volcanism". We encourage people who want to learn more details about the current phenomena, to read (at least some parts) of this article. - Since this article grew too long (once again), parts 15 and 16 have been created as separate articles. See links above. - NO earthquakes and the eruption continues at the same pace since a couple of days. Harmonic tremor with very strong bursts goes on. - Very visible stain and Jacuzzi on the webcam (a pity as the eruption webcam has not yet zoomed in). This process will intensify the coming hours, days and weeks as the erupting vent gradually climbs higher. The webcam also shows regular white patches (stronger turbulence NO SLS's). - Some people think that if they do not see SLS (Smoking Lava Stones), the eruption is decreasing. This is not the case, the SLS floating on the water in earlier days and weeks are ultralight ash blocks. - Most of the lava coming out of the vent / crater is pillow lava. Pillow lava is the lava structure typically formed when lava emerges from an underwater volcanic vent or subglacial volcano or a lava flow enters the ocean. We will shortly write an update zooming in on the characteristics of this lava type. - Joke just told us that Jacuzzi and stain can well be seen from El Pinar, higher on the island. Joke did return to her own house at El Pinar from yesterday afternoon.